To strike the right balance between academics and extracurricular activities, students of Top engineering college needs to organize. They should become an expert in time-management. By prioritizing time at this stage, you will develop a habit for a lifetime, to be an efficient and productive person. The important factor that is worth considering here is as follows. The students should be taught to know how to manage their time so that they can have the best of both the worlds. 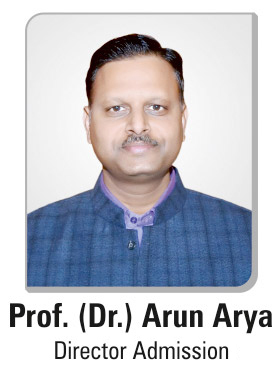 Arya is one of the Top Engineering Colleges in Jaipur. Students of best engineering colleges in Jaipur must plan out tasks in advance. It will provide clarity on high-priority tasks. This will enable you to complete your tasks on time. You also have extra time to study and even participate in extracurricular activities. You can either install a planner app that allows you to sort out your timetable in advance. Moreover, you can maintain a written planner which you can carry in your bag. Every college campus will have numerous activity clubs, but this does not necessarily mean that you have to be involved in each one of them. Be wise while selecting the ones that you want to join so that your time and energy doesn’t get drained. While students of Best B Tech College in Jaipur indulge in three to four clubs, make sure you remember that these extracurricular activities will help you in enhancing your leadership skills. Your academic counselor is the right person who can help you in chalking out your daily timetable in a systematic manner. The counselor who has expertise in this area will guide students of private engineering colleges Jaipur on how you can spend time on the extracurricular activities without impacting your study time in any way. He or she will also enable you to plan in a way that you prepare for any unexpected events. Also, it can easily accommodate them into your schedule. Effective time-management comes through an understanding of how to invest your time on the right things. This also means that students of engineering colleges in Jaipur should take smart breaks. Social media has its own advantages and disadvantages. In conclusion, following the above tips will certainly help you in planning your academics as well as co-curricular activities properly. So, prioritize your activities to transform your present-day efforts into success in the future.